On September 6, Mars announced their new Sustainable in a Generation Plan to invest USD one billion in reducing environmental impacts focusing on climate action, water stewardship, land management and improving livelihoods – putting pressure on peers to make similar commitments. Mars move now greens its existing USD 10.5 billion in debt and loans owned by creditors such as Northwestern Mutual Life and Lincoln National Life Insurance. Lincoln National Corporation, owner of Lincoln National Life Insurance, recently engaged with Friends Fiduciary Corporation, a Quaker socially responsible investment manager, regarding greening its bond portfolio. As shown in Figure 1 (below), Mars’ new commitment in effect begins to green Lincoln’s USD 24.4 million investment in debt issued by Mars wholly-owned subsidiary Wrigley. Mars bought Wrigley in 2008. This means that Lincoln is the beneficial owner with Prudential, JP Morgan, and Hamilton Lane the investment managers for the private placement of the USD 24.4 million debt. Figure 1: Lincoln National Corporation’s Mars bond ownership September 7, 2017. Source: Bloomberg. Mars’ new carbon reduction goal is to reduce the total GHG emissions across their value chain 27 percent by 2025 and 67 percent by 2050 (from 2015 levels) to keep the planet from warming beyond two degrees Celsius. 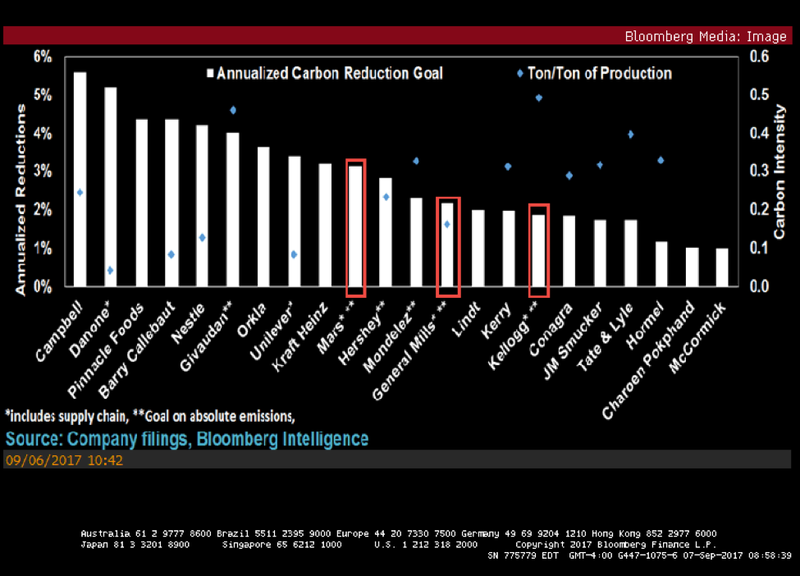 As reported by Bloomberg, shown in Figure 2 (below), Mars’ new annualized carbon reduction goal is ranked tenth amongst its peers. Mars now joins both Kellogg and General Mills in including supply-chain related emissions in its 67 percent emissions reduction goal by 2050. Mars also stated it wants to achieve net zero emissions from direct operations by 2040. Figure 2: Food peers’ annualized carbon reduction goals. Source: Bloomberg / Greg Elders. Mars is a family-owned USD 35 billion business with operations in 80 countries with 85,000 employees producing some of the leading food brands globally. They also produce pet supplies and provide veterinary health services. Mars’ commitment includes separate beef, cocoa, palm oil, pulp and paper, and soy policies. As shown in Figure 3 (below), these policies apply to 100 percent of these raw materials sourced by Mars. The company also has similar human rights and labor commitments. 2017: 100 percent of Brazilian suppliers in compliance with forest code and not associated with primary forest clearance in the Amazon Biome. Now that Mars has made these policies, their implementation may need to be assessed to ensure achievement. Will Mars’ Debt Now Be Considered Green? As shown in Figure 4 (below), Mars has USD 12.5 billion in debt and loans outstanding split between itself and its wholly-owned subsidiary. Mars’ creditors may experience price impacts on Mars’ outstanding debt and loans. As shown in Figure 5 (below), Mars key creditors are globally recognized asset managers and asset owners, many of whom have green finance commitments. Mars’ Sustainable in a Generation Plan announcement may mean that its debt and loans described above may now be considered “green loans” and “green bonds”. There are currently globally USD 200 billion in green bonds outstanding and possibly USD 130 billion in green bonds may be issued globally in 2017. Since Mars’ debt and loans may finance a portion of the company’s USD 1 billion Sustainable in a Generation Plan commitment, these creditors may find that their debt and loans migrate from brown to green. Meanwhile, at the same time, it is expected that Mars’ commitment will mitigate deforestation in its supply chain. Finally, September 5, HSBC reported that in developed markets green bonds are trading closer to benchmarks than regular debt issued by the same company as investor demand in the secondary market increases prices. Mars now has an opportunity to lower its funding costs and improve the liquidity of its debt if Mars decides to also green its capital structure. By spending time and effort – as Mars is doing setting its new sustainability goals – greening it capital structure, the company can increase investor demand by greening its debt and loans via ring-fencing its debt or loans to fund its USD 1 billion Sustainable in a Generation Plan. Increasing demand would decrease Mars’ cost of funds resulting in more capital available to fund deeper long-term value additive sustainability achievements while increasing their competitive position versus their peers.